Introduction: Ultraviolet radiation from sunlight is the common cause for skin aging, premalignant skin lesions as well as melanoma and nonmelanoma skin cancer. Most skin cancers can be prevented by avoiding prolonged direct exposure to the sun or by treating the skin with antioxidants before sun exposure. Evidence demonstrates that natural compounds with anticancer properties may play a crucial role in cancer prevention, growth and progression. 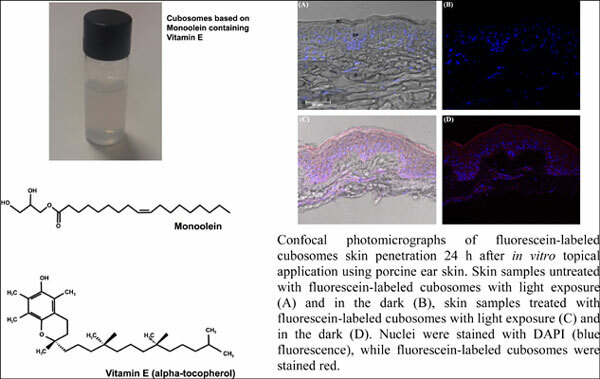 Vitamin E (VitE) was shown to possess antitumor activity in the skin with its skin barrier-stabilizing properties and protection against UV-induced skin photodamage through a combination of antioxidant and UV absorptive properties. In this study, we developed and investigated the potential of VitE encapsulation in monoolein and poloxamer-based cubosomes in topical administration. Physicochemical characterization and stability studies were evaluated to better predict their performance when applied to in vitro and in vivo studies. Materials and Methods: Cubosomes were prepared by the hydration of the thin lipid film. The particle sizes, polydispersity index, zeta potential were obtained by dynamic light scattering and the encapsulation degree by ultrafiltration process. Physical stability of the Cubosomes nanodispersions obtained herein were evaluated under accelerated conditions (low, high and room temperature) for 40 days while in vitro release, permeation and skin retention by Franz diffusion cell. Results: The formulations containing with or without VitE displayed homogeneous appearance, with sizes in the nano-range (around 200 nm), and low polydispersity index. There was no statistical difference between cubosomes only and VitE incorporated cubosomes (0.2 mg/g). The encapsulation degree of VitE in cubosomes was approximately 100%. The cubosomes were physically stable for 40 days even under semi-harsh conditions. VitE skin permeation studies showed increased VitE in the deeper layers of the skin, which is important for the success of the topical skin cancer treatment and prevention. Conclusion: Based on the physicochemical characteristics of the monoolein and poloxamer-based cubosomes nanodispersion results, we believe that cubosomes are potential delivery systems for topical administration of VitE. Further studies using melanoma cells line and animal cutaneous cancer models will be performed to verify VitE-loaded cubosomes nanodispersion treatment and efficacy. Vitamin E, skin penetration, cancer prevention, nanodispersion, cubosomes, monoolein.